Heidi Damayo and Andrew McNee in the Arts Club Theatre Company production of Mustard. Photo by Mark Halliday. 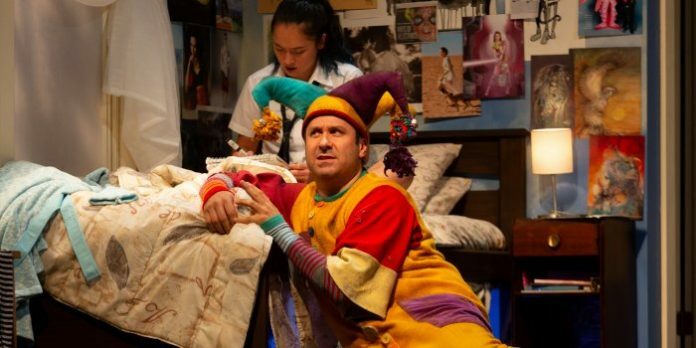 Opening the Arts Club Theatre Company’s season on its Granville Island Stage, the dysfunctional family dramedy Mustard is sometimes engaging, but often overwrought, world where fantasy collides with reality. Mustard is the name given to the imaginary friend who lives under Thai’s bed. First appearing when she was a baby, problem is she is now 16 years-old and has yet to be able to let go of her foul-mouthed and scatological cartoonish creation. As Thai’s real-world continues to crumble around her, Mustard’s relevance finally comes into question. At the same as Thai debates the fate of her imaginary friend, Mustard is also being pursued by a couple heavies from Mustard’s imaginary plane. Seems there is a shelf-life for imaginary friends, and this Mustard is well past his best before date. To help ensure his removal, Mustard is visited by two other-world enforcers, Bug and Leslie. Tasked with ensuring he is carted off to that place where all imaginary friends live out their existence when they are outgrown, the problem is their role never really progresses to anything beyond a mere excuse for some cartoon violence. 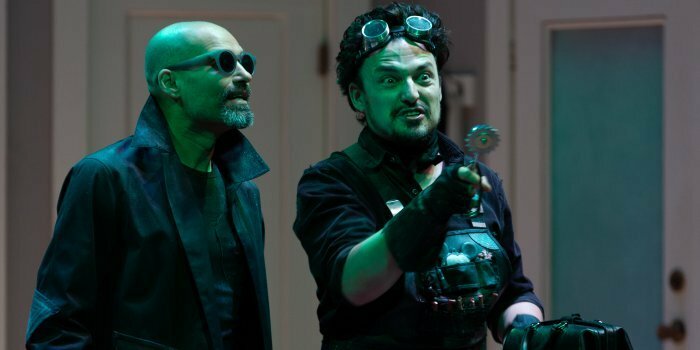 Shekhar Paleja and Brett Harris as the other-world enforcers, Leslie and Bug in the Arts Club’s production of Mustard. Photo by Mark Halliday. While on paper it may all sound like a quirky take on the dysfunctional family genre, it is only intermittently successful. Most problematic is the lack of any real connection to the family and their real-life problems. In the end it is Mustard who becomes the focus for our sympathy. 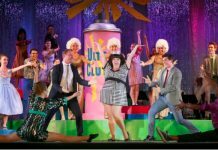 While it could be argued this is part of Sandler’s design, as a representation to the end of innocence, it is problematic when we don’t feel for the real people on stage. One of the biggest disappointments though comes in playwright Sandler’s decision to telegraph the connection between Mustard and Thai’s father so early. Rather than a surprise, it drives to an inevitable conclusion. What’s interesting is while director Stephen Drover successfully married the fantastical with reality in the wickedly funny Hand of God last year for the Arts Club, or even Titus Bouffonius for Rumble Theatre, he can’t seem to find the right balance to make Mustard work. A comment more on Sandler’s play than anything, but Drover doesn’t help either with too much screaming and an emphasis on some of the play’s crasser humour, especially when Thai’s boyfriend is caught literally with his pants down. Despite an overall feeling of ambivalence towards Mustard, Andrew McNee does bring home a terrific performance as the title character. Dressed in costume designer Carmen Alatorre’s ridiculous clown suit, he somehow finds a balance in all the mania and is a big reason why Mustard is the only character where we find a connection. That isn’t to say others don’t do some decent work here as well, but it isn’t as consistent. As an example, as Bug and Leslie, Brett Harris brings an interesting spin to Bug while Shekhar Paleja is decidedly one-note. As the mom, Jenny Wasko-Paterson is intermittently emotionally resonant. Under Drover’s direction though, Heidi Damayo as Thai leans towards just being a loud-mouth teen and as her boyfriend, Chirag Naik battles against the silliness he is given. Drover though has to be acknowledged for the diversity in his cast. On the production side, set designer Kevin McAllister gives us a wonderfully realistic family home with a few fun twists to accommodate the visits by Bug and Leslie. Lighting designer Alan Brodie provides definition between the reality and the fantasy. But while Mustard looks great it is only ever intermittently successful. The overall effect is very much like getting run-of-the-mill French’s Yellow, when what you really want and expect is some spicy Dijon. Mustard by Kat Sandler. Directed by Stephen Drover. 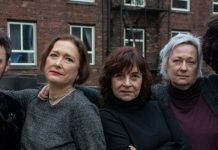 An Arts Club Theatre Company production. On stage at the Arts Club Granville Island Stage (1585 Johnston St, Vancouver) until October 20. Visit artsclub.com for tickets and information.